Over at the OnSoftware Blog, they sat down with Jay Sullivan, VP of Products at Mozilla Corporation to speak about the new version of Firefox Mobile. The interview took place in time with the Firefox Mobile release on Android recently. Jay Sullivan answered questions about the importance of Firefox going mobile, and most importantly (to us) about the possibility of a WP7 version. Sullivan stated that Firefox Mobile is a big focus at the moment as mobile devices become more important and powerful. However, Windows Phone 7 is currently not in the horizon, but “it may bring Firefox Home to Microsoft’s mobile platform.” Jay Sullivan also mentioned other things in the interview such as the disadvantage of an application like Firefox going mobile: Getting add-ons into the browser seems to be a huge problem at the moment. You can read all about the add-ons situation and more feedback on Firefox Mobile, but if you just want the (only) WP7 details, you have the exact quote below. Are you thinking about new platforms like Windows Phone 7? At the moment we are focusing on Android in terms of the browser. For those other platforms we may do things like Firefox Home, so you can fire up any browser and get to your Firefox data. We’re not looking to bringing Firefox itself to Windows Phone 7 at this point. 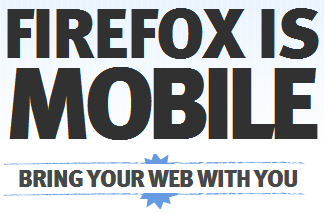 Is Firefox Mobile essential for you on your mobile device? What would it need to stand out among other (mobile) browsers? Comment below. Microsoft really should put a WebKit browser on Windows Phone 7, as it would be much faster than the current IE7 mobile that is on WP7. Currently, WP7 is the only mobile platform that doesn’t have a WebKit browser. Mozilla would not be able to get Firefox working within Silverlight. Therefore, it could only be done with native code. Microsoft will always refuse native code on Windows Phone 7. Possibly next year, when Microsoft resets its mobile platforms once again, and moves to Windows 8 on tablets and phones, Mozilla might then be granted access to native code. Microsoft should grant Phone 7 access to Firefox. I prefer Firefox over Internet Explorer. Internet Explorer is a lot slower than Firefox and Google Chrome. IE9 is coming to Windows phone 7 in 2011. new Firefox has been reported to have memory leaks, so if the same on windows phone no thank you. IE7 is good enough at the moment, IE9 will be the best mobile browser.